By no means am I beginner when it comes to cooking or using a slow cooker. But I am always looking to try out new recipes and I have a child that wants to help in the kitchen. So when I was offered the opportunity to try out the Slow Cooker Recipes for Beginners ebook in exchange for an honest and unbiased review I agreed. I thought this could be a great book for my daughter and I to try some recipes out of. She is a sprouting chef and I thought if these recipes are for beginners than she should be able to handle it. For a beginner cookbook there are several options. What I appreciated the most was the variety in dishes and having some known dishes in the book. I always like a try out a few recipes before I say a cookbook is good. Peyton and I decided to try out the Vegetarian Chili. One of the reasons I chose this was for all the colorful vegetables. And it was mostly a chopping and dump recipe so I was pretty sure a 5 year old could do it. 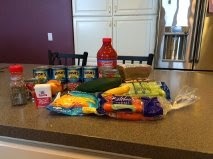 Our first task was to gather all the ingredients. There were numerous items needed for the recipe but I was very pleased when I noticed these were ingredients I could find at any grocery store. 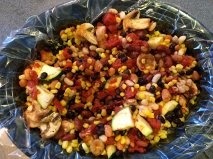 Once we had all our ingredients laid out we went to work on chopping up the vegetables and draining our beans. The prep time took maybe 20 minutes. And then we were able to dump everything into the crock pot and walk away for several hours cooking it on low. If you are just starting with the crock pot and learning how to use it I highly suggest crock pot liners. Since the crock pot is left on all day cooking there tends to be caked on food when you are finished. Sometimes it can be extremely difficult to clean a crock pot when food has been simmering in there all day. 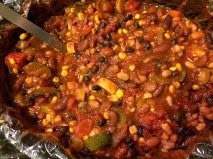 As you can see the vegetable chili is a very colorful dish! And full of fresh vegetables. The corn needed to be frozen because otherwise it can be mushy in crock pot cooking. And here it is all finished! I would say the recipe was true to timing and amount that could be fed. I think it is also the correct difficulty level for a beginner. And the veggie chili was delicious! I received an Ebook copy of Slow Cooker Recipes for Beginners for evaluation purposes. Regardless, all opinions expressed are still 100% my own. I am disclosing this in accordance with Federal Trade Commission 16 CFR, Part 255 Guides Concerning the Use of Endorsement and Testimonials in Advertising.